Q-Peak offers ultrafast lasers utilizing novel gain materials for use in scientific research and materials processing applications. Our capabilities include ultrafast, high-repetition rate oscillators, pulse stretcher and compressors, and an array of regenerative and linear amplifier systems for the generation of high-peak powers. The output from these laser systems can be combined with our non-linear optics capabilities providing wavelength tunabiltiy from the UV to IR. These individual components can be combined to provide a custom laser system to meet your needs. Q-Peak has developed mode-locked oscillator and amplifier laser systems utilizing a variety of gain media. The table below summarizes a selection of the materials and their center wavelength. Diode-pumped, mode-locked, Cr:ZnSe oscillator generating sub-100-fs pulses, with > 80-nm spectral bandwidth at a 100-MHz pulse repetition rate. 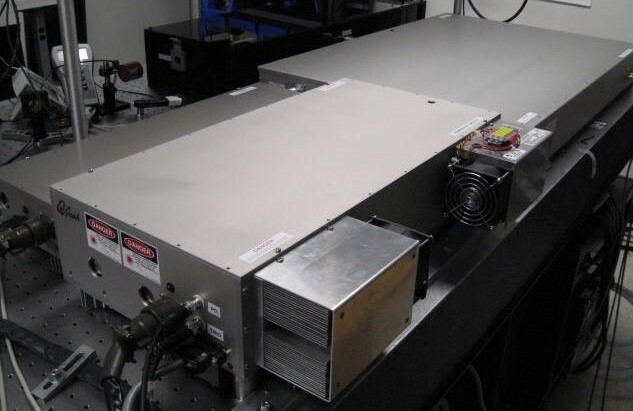 High pulse-energy, Cr:ZnSe, chirped-pulse, regenerative amplifier laser system producing 1 mJ per pulse at a 1-kHz repetition rate with a pulse duration of 185 fs, corresponding to a peak power of 5 GW. A fiber laser-pumped, Ho:YLF, regenerative amplifier system followed by several stages of linear amplification capable amplifying a 3-ps seed pulse to >25 mJ per pulse. A diode-pumped, Yb:KYW, femtosecond oscillator, chirped-pulse, regenerative amplifier, laser system. The output was sent through a series of nonlinear conversion to generate 150-fs pulses in the UV (selectable at 259 nm or 345 nm).